On Christmas Day we have our traditional meal of turkey accompanied by roast potatoes and Brussels sprouts. We always cook far too many vegetables so that a couple of days later we can have our own family tradition of cold ham with Bubble and Squeak. Many of you will know about Bubble and Squeak but as I’m lucky enough to have a number of overseas followers, this is for you. 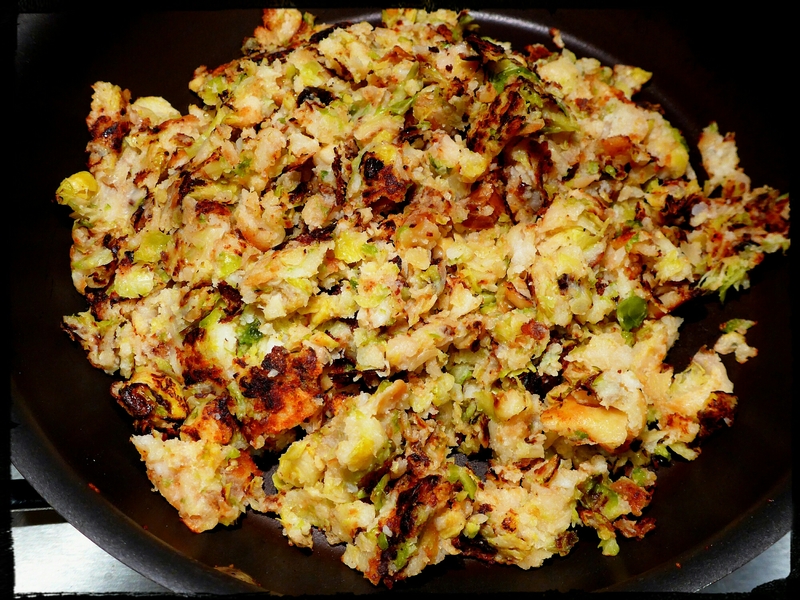 Bubble and Squeak is a delicious mélange of cooked potatoes and cooked sprouts. It’s best to leave them for a couple of days to mature before making B & S but then take your potatoes and break them up, I use my hands, to separate the crisp outside from the soft and floury inside; I then chop the Brussels and use the side of the blade to squash them down a bit. Heat a good heavy frying pan and add either beef dripping or goose fat, when it’s smoking hot add the vegetables and mix them round to get good sprout distribution before pressing it all down into a dense layer. Let it cook through then mix it all again and repeat until it’s nice and hot. By now the bottom of the layer will be burning a nice brown and crispy layer; keep mixing this in until you have a good mix of burnt crust, potato and sprout. Then serve. We have it with cold ham and English mustard, sometimes I have some brown sauce on the B & S but tonight’s was delicious without. This makes a wonderful meal for a cold day like today and really sticks to your ribs. Oh, and a warning, I’m not sure which is the bubble and which is the squeak but I know that tomorrow I will bubble and squeak too. It certainly is …. er was! Gosh, I haven’t had that for many years! Next time I might try it with mustard. I’ve also never had it with Brussel Sprouts – Its usually potato and pumpkin and any other leftover vegetables. It is a dish that appears sadly neglected these days as it’s really delicious; having said that it seems to be cropping up on the menus of gastropubs a bit. My recipe is traditional but you can certainly include other leftover vegetables although I’ve never been sure about pumpkins myself. By the way the mustard is for the cold ham, must be English mustard and not namby-pamby French stuff. OK, point taken :) I don’t think I’ve cooked Brussel Sprouts voluntarily since I left home so without other leftovers, it’s just reheated potatoes, although potatoes reheated in duck fat which is never a bad thing! You REALLY need to try and find some sprouts, bubble and squeak without sprouts is like a kiss without a moustache! !